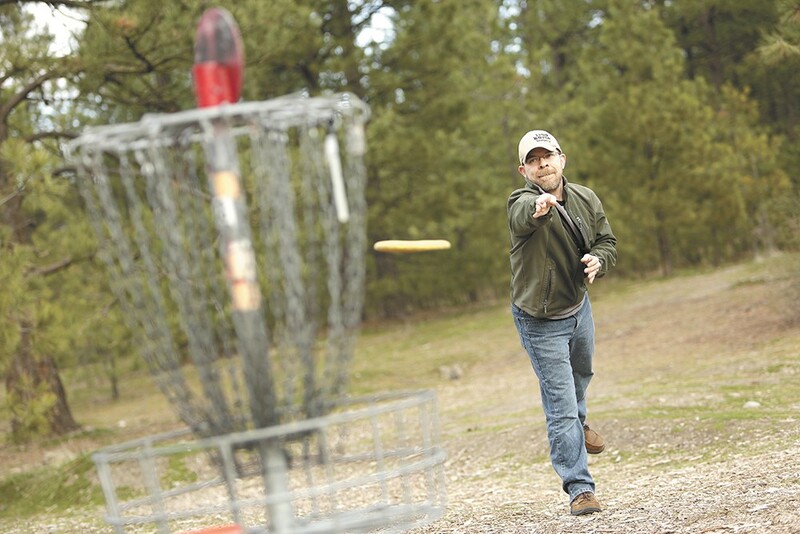 Downriver is one of three public disc golf courses in Spokane. You can barely see the faded paint on some of the trees. It's a faint reminder of what the Downriver Disc Golf Course used to be — a handful of baskets made from 5-gallon soy sauce buckets left over from Gordy Crafts' restaurant. Crafts, the now-retired owner of Gordy's Sichuan Cafe, moved to Spokane from California in the early '90s. There were no disc golf courses to speak of, so he tossed a disc at objects that were already there: park benches, fence posts, trees marked with paint — what Crafts calls a "guerilla course." Then he started building holes, and the people started coming. "We never thought it was going to be this big," he says now. He and a few other disc golfers started slowly building out the course: baskets with chains hanging from them like the ones on professional courses throughout the country, tee boxes, signs and benches. By 2001, donations and small course fees built up enough to assemble an entire 18-hole course, which eventually was turned over to the city. Today Downriver is one of three public courses in Spokane, showcasing 18 holes scattered alongside the roaring Spokane River. On a chilly weekday afternoon in mid-March, the course is crawling with players looking to get a few holes in before sundown. There's a foursome of dudes in neon hoodies, a couple and their kindergartner, a pair of buttoned-up fellas in polos and a chatty group throwing back a few PBRs between tosses. Some bring their dogs. One dad brought his daughter, who rides on his shoulders between holes. Spokane's first (and now voted best) course is rated one of the toughest in Washington state by the Professional Disc Golf Association, due to the frequent changes in elevation and trees scattered throughout. Crafts, who designed his own private courses as well, says a beginner could test the waters for $20 — the cost of two discs. "It's truly a premier lifetime sport," he says. "It's free to play 365 days a year, just like it always was. Park is open from dawn to dusk."